Montgomery Clift was described by his biographer Patricia Bosworth as being “so beautiful you could hardly look at him” and by Karl Malden as having “the face of a saint”. As Amy Lawrence explores in The Passion of Montgomery Clift, the actor is remembered by friends and fans alike with a deep, almost religious reverence. His brooding characters and his personal struggles added to his image as a martyr and what Lawrence calls “an icon of suffering”. He is often characterized as a tortured, tragic figure—an immensely talented, handsome and rebellious actor and closeted gay man, worshiped by his audience, then suddenly and cruelly scarred in a car accident that doomed him to years of alcoholism and painkiller addiction, and eventually, his untimely death in 1966, 44 years ago this week. 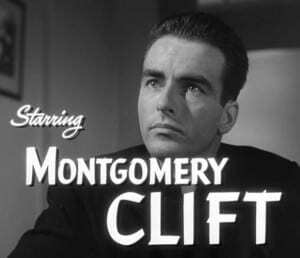 But there’s more to Montgomery Clift than the dominant myth, Lawrence finds. Challenging the perception of Clift as a tragic victim, she reveals how throughout his career, he actively molded his image and deliberately instilled a flawed humanity into each of his roles. In an interview with The Advocate, Lawrence said of Clift: “In giving interviews or choosing roles, he knew exactly how to shape a performance to achieve the effect he wanted….For instance, he was aware that screenwriters and directors often wanted to make the hero perfect; Clift wanted to make the character human, complicated, and not always admirable.” This unique ability, says Lawrence, makes his best performances timeless, while others from the era have become dated. Montgomery Clift’s beauty has been described as “blinding” and “impenetrable”, suggesting that it became a barrier that obscured the person inside. Indeed, writes Lawrence in the book, we do not know what Clift was thinking, but as an actor he showed many faces, and invited his audience to engage their imaginations with his performance. Lawrence shows how four decades after his death, Clift’s legacy is continually reinvented.